6.30pm to 10.30pm (weekends and public holidays). TAI Zi Heen is adding a delicate modern touch to traditional Chinese New Year dishes through specially prepared menus. The restaurant located in Prince Hotel and Residence Kuala Lumpur is greeting the Year of the Horse with a scrumptious spread of dishes through three delightful set menus.The set menus for 10 persons per table are Spring and Happiness, Everlasting Prosperity, as well as Wealth and Fortune.The menus, designed by Tai Zi Heen’s Chinese head chef Michael Wong, who specialises in Cantonese cuisine, feature both Western and Eastern influences for a modern twist.Some of the highlights include the Four Seasons Prosperity Yee Sang, featuring raw butterfish, salmon, tuna and jellyfish with crispy shredded treasures. Prince Hotel and Residence, Kuala Lumpur’s Tai Zi Heen Chinese Head Chef Michael Wong (middle) with the delicious Four Seasons Prosperity Yee Sang, made with crispy shredded treasures and blackcurrant- plum dressing and topped off with raw slices of butterfish, salmon, tuna and jellyfish; and his other Chinese New Year creations. It is doused with a beautiful blackcurrant-plum dressing that gives the dish its sweet, tart flavours befitting the refreshing nature of yee sang. A traditional Double Boiled Fish Maw with Chicken and Dry Scallop Vegetable Soup is a light broth that opens up the palate for the extravagant dishes to come. 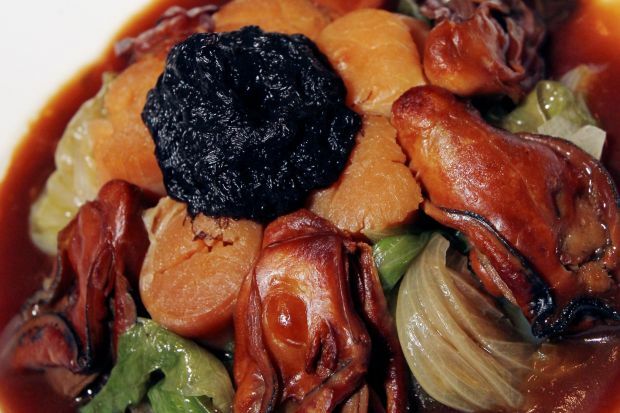 The Braised Japanese Sun Dried Scallops, Dried Oysters and Fatt Choy is a dish with Japanese influences and the traditional new year ingredient, black moss, represents prosperity. The delightfully shelled Crispy Prawns Coated with Lemon Dressing Garnished with Tropical Fruit Salsa and Tobiko is tantalisingly crunchy. The white shell prawns coupled with the bits of diced fruits heightens the mellow natural sweetness of the sea prawns. Another contemporary dish is the Baked Salmon Fillet with Honey and Onion Rings, a smokey and flavourful dish. “The dish uses Norwegian salmon instead of the usual garoupa or Malaysian fish for a Western influence. 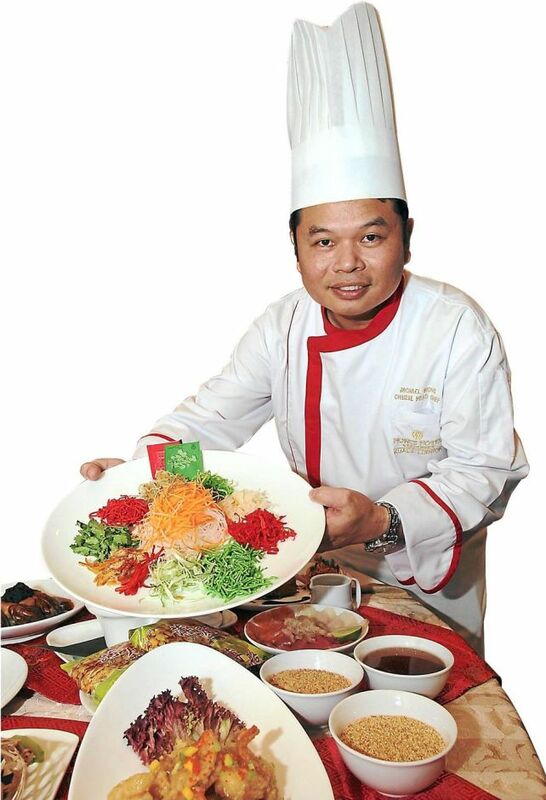 “The dishes are not regular and I have confidence in these fusion style dishes, from the taste to the presentation,” said the experienced chef who has been working in the industry for 28 years. Diners can choose to end the seasonally delightful meal with the Chilled Pumpkin Puree with Sago Cream Topped with Vanilla Ice Cream and Pistachio Nuts. The decadent dessert is a mix of velveteen creaminess with the bubbly textured sago that is complemented by the Crispy Deep-Fried Chinese Brown Sugar Sesame Balls made with traditional sticky Chinese New Year cake. The set menus are priced from RM1,288++ to RM1,988++ per table. The promotion is on from now until Feb 14.